The sheriff of St Clair County was established in 1821 by then territorial governor Lewis Cass. Henry Cottrell became the first sheriff of the territory. Since then, 41 men have held the position of sheriff and scores of other men and women as deputies and employees. The first county jail was built in 1827 by St Clair resident James Fulton. The jail was kept in St. Clair until 1871 when the county seat was changed to Port Huron. In 2006, the new 200,000 sq foot plus Correctional facility opened, housing both the adult and juvenile offenders. Over the nearly 189 years of its existence, the men and women of the department were involved in several noteworthy instances. Several are outlined below. In July of 1934, members of the office including then undersheriff William Cavanagh responded to reports of a man with a gun in an establishment on the south side of Port Huron. When they arrived, they witnessed a man with a gun sticking out of his coat. Undersheriff Cavanagh approached and removed the gun; however the subject produced another and shot the undersheriff. In the exchange of gunfire that followed, five subjects were injured including the suspect who received fatal wounds. The suspect turned out to be Herbert Youngblood, a known accomplice of the notorious John Dillinger. In November 1937, Frank Novak and Edward Schere are witnessed by an off duty special deputy, peering out of the windows of the post office in Smiths Creek. When they attempted to leave later in the day, they were met by heavily armed deputies. The two retreated into the post office and later exchanged gunfire with the deputies. After a five minute gunfight, the two suspects were found dead inside. On December 11, 1971, an explosion occurred while constructing the supply tunnel for the Lake Huron Treatment Plant. The plant was to provide water to Detroit’s northern suburbs. The tunnel, a 16 foot diameter structure was six miles long and buried 230 feet below Lake Huron. It appears that methane gas was released from the surrounding shale during digging. The gas accumulated in unventilated portions of the tunnel and was ignited causing an explosion. In total, 22 men lost their lives to the explosion and several other were injured. Two deputies were among the first to arrive and descended down to the injured workers, soon to be followed by more deputies and other emergency workers. To this day, this still ranks as one of Michigan’s deadliest industrial accidents. On April 7, 1982, the five members of the Richard Guiliani family were found murdered in their Yale home. Within nine hours, Detectives had identified and arrested James D. Porter, a 16 year old county resident, for the crimes. Porter would be tried and found guilty of the murders and is still serving five life sentences. On January 7th, 1985, two men committed an armed robbery at a Fort Gratiot bank. After exchanging their first vehicle for a Ford Bronco, they headed for Interstate 94. Deputy Gleason spotted the Bronco and made a traffic stop on the vehicle on I-94 near Range Rd. The suspects opened fire on the deputy’s vehicle, with one round ricocheting through the window and striking Deputy Gleason in the forehead. Deputy Gleason continued the pursuit eventually taking custody of the two before going to the hospital. A .357 caliber round was later removed from his sinus cavity. Ray goes onto finish his career becoming one of the most respected deputies to serve in St. Clair County. On April 16th 2008, Capac police Chief Raymond Hawks was investigating a reckless driving complaint. The suspect, Donald Burke, was known by the chief and he requested assistance while making contact. When Deputy O’Boyle arrived in the area, the suspect fired on the officers, striking the chief in the torso and Deputy O’Boyle in the head. Concerned citizens and a local tow truck driver braved the gunfire and removed the chief to medical personnel. Deputy O’Boyle remained on scene, giving out valuable information to responding officers. He was later taken to the hospital for treatment. The suspect was found later hiding in a nearby vehicle. 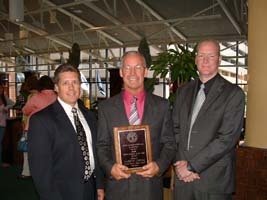 For his courage, Deputy O’Boyle was awarded Officer of the Year 2009 by the Police Officers Association of Michigan.